Longer today on day 2. At FC for 10am and greeted by the boy opening door shouting for Daddy. Spent time playing with him on floor – loves cars & trucks, and noisy toys Then we all went out for walk to local play area. I pushed buggy down there while T & FC chatted. 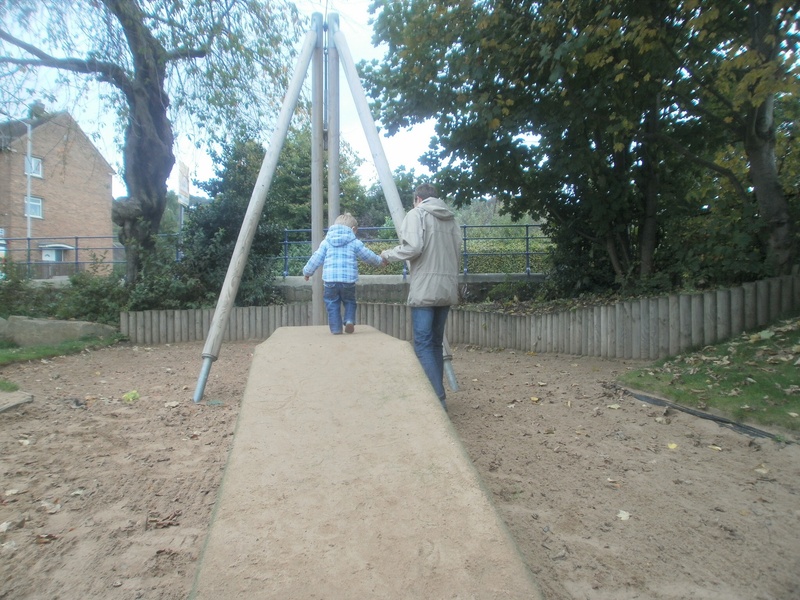 Once in park it was run round and play on everything letting Mummy join in as well as Daddy. Best bit for of us was him walking up ramp to flat bit for zip wire (broken) & confidently jumping/launching himself at us from end (3.5 ft drop). He trusted us both to catch him which was an immense feeling. Only launched himself if one of us there as well. Lots of fun had by all with swings, houses & slides. We spent the time with him while FC sat on bench. Sausage & chips for lunch from local chippy. Eaten in main park with occasional chasing by Mummy or Daddy when he ran off. Fed the ducks with bread with just me as Daddy stayed with buggy. On way back to FC’s house – T pushed this time while I chatted – the boy fell asleep so after getting wellies off his feet laid him on couch while we chatted for a fair while. When he came to happy to curl up on Mummy’s lap snuggling till fully awake. Wonderful feeling. Played a while longer before we had to leave (later than planned) as picking up new larger car. Tomorrow we take the boy out for part of the day from after we arrive till just before other foster kids due back from school. This is a day earlier than expected but we already have car seat etc. so fine I hope.